This charming holiday apartment is in a secluded location at the end of a small dead-end street and only fifty meters from the beautiful beach of Bergen aan Zee. 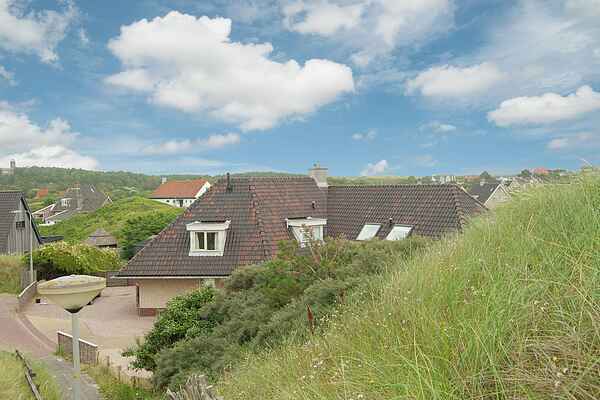 As the name ‘Zonnewijzer’ (Sundial) suggests, this holiday home is excellent for sun lovers. The living room of this holiday home has very charming windows in the cozy seating area. The 'helm-dune' garden has several patios and loungers, so you can really enjoy the sun there. There is also a sauna cabin in the garden, which you can use for free. The woods and lovely center of Bergen with its great pavement cafes and trendy shops is only 500 meters away. Around Bergen there are beautiful cycling routes, including through the quaint villages of Schoorl and Groet. The beautiful city of Alkmaar with its canals and cheese museum is definitely worth a visit. Amsterdam and Haarlem can also be reached by car.